My gift from Sophie and Jake. I think this is the best birthday present I have ever received . . . in my entire life. Even though I felt sad that I am getting so old, I had a great birthday celebration this weekend. The celebrating started on Friday, when I used my lunch hour to go junking at Good Finds, down on the south side of town. The parking lot at Good Finds is nothing but white sand, so when I got out of my car I felt like I’d just taken a little trip to the beach. It was so warm, freakishly warm for February. The cabbage palms were rustling, and the doors at Good Finds were wide open to let in the warm breeze. Good Finds is in a rambling, ramshackle old house, and it’s full of funky treasures—old rhinestones and vintage aprons and ‘50s beaded purses and such. I ended up buying a deviled egg tray to hold Easter eggs at my upcoming Easter party. The tray has a wonderfully garish ceramic chicken in the middle. I love it. After work, Dad, Bun, Kris, Jake, and I met at La Fiesta for my birthday dinner. (Sophie had to go to gymnastics, so she wasn’t there.) Bun and I were standing in the parking lot, enjoying the balmy breezes when Kris and Jake pulled up. Jake started things off right by staging a dramatic fall out of the car. (He always likes to make a splashy entrance.) The fall was really elaborate. There was rolling involved. And then there was some hopping on one foot (he claimed to be injured). Bunny and I were in stitches. Jake is too awesome. He’s seven, with big blue eyes. We talked a little about organic vegetable gardening, too, and Dad’s awesome juicer. Dad told us his favorite recipe for making juice. “I start off with a beet,” he said, beaming. “That gives it all a really nice red color. Then I add bok choy, asparagus, cucumbers, celery, and a Granny Smith apple!” He was grinning so proudly. I thought Jake was being very good at the dinner, but apparently he was kind of bugging Kris. Apparently he spent the entire time pestering her to take him outside. But I totally missed that. Jake was climbing on a wall outside La Fiesta as I stood nearby, below him. So he jumped down (not on me, thankfully) and started balancing on some parking curbs and swinging around on a sign. Kris was rolling her eyes and sighing dramatically. The celebration continued on Saturday night when we went over to Mom’s house for a joint birthday party for Mom and me. The couch in the living room was full of presents wrapped in frothy ribbons and the fanciest paper (printed with bright red geraniums). There were shiny red gift bags stuffed with pink tissue paper and tied with fat bows like flower corsages. Mom is the best present wrapper in the world! Sophie was at a movie with a friend, and we couldn’t eat or open presents until she got back. So, while we waited, we went out to play in the yard in the strange wonderful freaky warm weather. Mom’s yard is so lush. In late February it’s a wonderland of wild violets and very old, blooming camellias. Bunny wanted to go out and carefully look at everything—the trilliums, the white violets and ferns, and the camellia blossoms so fat they look like cupcakes. Then he came back (after five seconds) and hit me in the kidneys with the noodle. Jake kept quitting the noodle fight because Bunny and I weren’t playing right. (He was worn out and cranky because we’d spent the entire day at the extremely exhausting Fun Station.) “I’m not playing with you anymore!” he’d cry. But then he’d be back, bashing me with his noodle. "Sons of butts, I think you mean," I said. “Jake!” Kris scolded. But then he was back again and I was being whacked in the face with the noodle. Jake whacked me with the noodle again. Later Bun and I followed Mom into the Secret Garden to see the new trees and wild azaleas she’s been planting. (Jake was standing there with his noodle, crying, “Where are you going? What are you doing? Nobody wants to play with me. . . .” He went and pouted on his swing.) While we were admiring the trees, the phone rang in the house, and Mom yelled, “Go! Answer it! Who’s the fastest? !” (Mom is bossy like that.) And then, because Bun and I have slow reaction times and Mom is the biggest busybody in the world, she gave up on us almost immediately and started scooting to the house on her poor arthritic feet as we tried in vain to overtake her. She was limping along at top speed. Next, Bun and Jake and I played a short-lived game of Go Fish. Jake cheated the entire time, then quit because he claimed, falsely, that Bunny and I were cheating. Sophie got back from her movie, and we all sat down at the big dining room table, under the crystal chandelier. There were pink napkins and a pink flowered tablecloth and fancy dishes (Mom's Butterfly Meadows collection). Everything was so festive. Sophie had made special birthday cupcakes for Mom and me. They were craftily frosted with mounds of fluffy white icing in order to look like servings of mashed potatoes. The gravy was really caramel sauce, and the butter pats were lemon-flavored Starbursts. 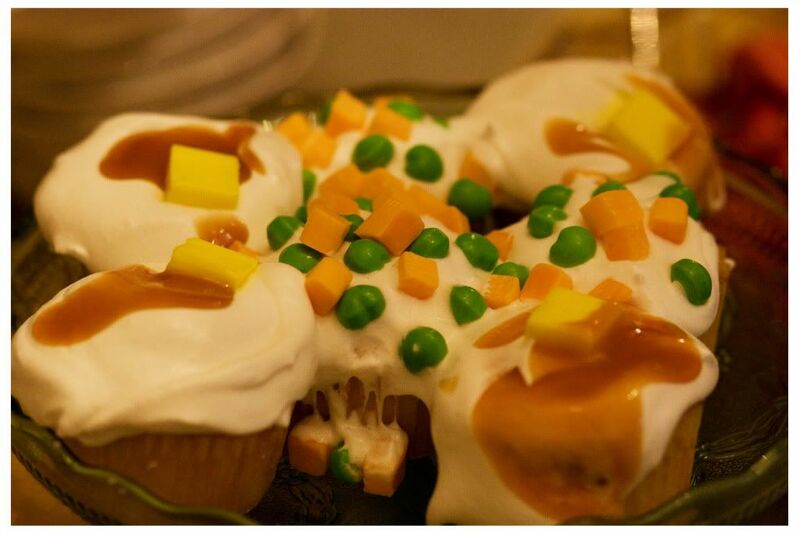 Some cupcakes were topped with butter pats, and some were topped with “peas and carrots.” The peas were lime Runts, and the carrots were chopped orange Starbursts. Mom was being so funny. She kept calling the Runts “Grunts.” It was making Sophie so mad. But that’s the thing about Mom; she makes up her own names for things. One time Kris had this roommate Mom didn’t like. Her name was Karen, but Mom always called her Nancy because, in Mom’s opinion, “she didn’t deserve a nice name like Karen!” Seriously, Mom never failed to call her Nancy. And after a while we all started calling her Nancy. The table was groaning with food—cupcakes, homemade crackers (wonton wrappers baked with olive oil and sea salt! ), golden butternut squash soup with lots of ginger, and pastry shells stuffed with sugared sliced strawberries. It was such a feast. Mom always fixes waaaaay too much food and then fusses at us because we’re not eating enough. She makes enough for 50 guests, and there only six of us. But I’m glad she never learns. It would be such a disappointment if Mom’s dinners were just normal dinners instead of crazy, irrational, wondrous feasts. After supper, we opened presents. Kris and Bun and I gave Mom a new sewing machine and a birdbath shaped like a bird’s nest (with stone birds perched on the edge), and Jake gave her some Bath and Body plug-ins. Oh, and Sophie gave her the most awesome little beaver that she made in her pottery class. I was really moved by the presents I received. They were so nice. Sophie and Jake gave me, truly, the best present ever—a stuffed pink pig, the cutest pig in the world. When I opened it, I was so overwhelmed that I kept saying the same thing over and over: “Oh! My! Gosh!” I was stunned by the kids’ thoughtfulness. They picked the little pig out themselves, and it was just what I wanted. 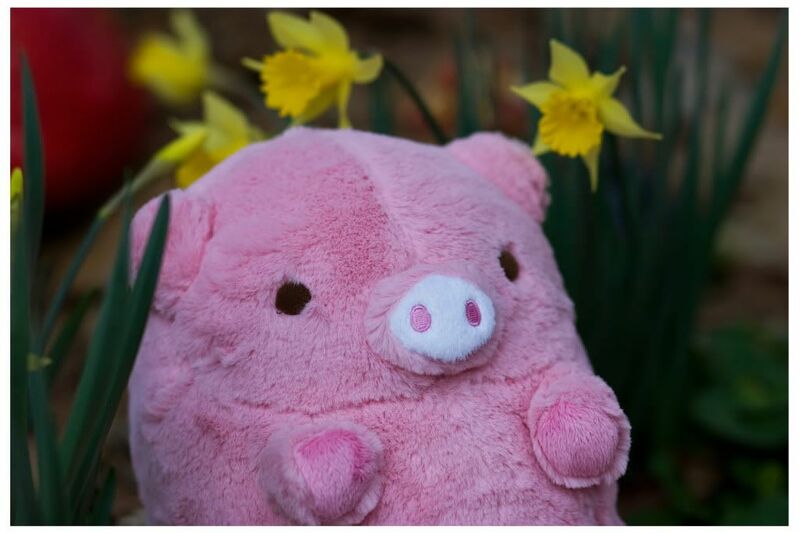 I handed Bunny my marvelous piglet. She gazed at it for a moment, cradling it like a baby, then handed it back, her expression quite serious: “No. Uh-uh. It’s a girl,” she said. She sounded very authoritative. “I think I will call her Rosebud,” I said. Sophie also gave me a little Fimo clay snail she’d made. It was so cute—cheery green and yellow, with polka dots. I got other presents too. I got presents galore: a stone owl statue for my garden, a purple Fiestaware serving bowl, two glass refrigerator boxes, a painted Nippon pitcher, a little Nippon tray, and a Mary Proctor painting featuring ladies in big hats picking watermelons. We had a great time sitting in Mom’s pretty living room, admiring all the presents. I was sitting on the floor and I said, “I must be really tired because this rug feels so soft and good.” It was quite plush. Sophie was showing off her latest Lego creations. She had just built an elaborate police station, and she was showing us all the features—the helicopter landing pad, the two garages, the mugshot room. . . . Sophie loves to come and spend the night with Mom and work on her enormous Lego kits. She and Mom sit together in Mom’s cozy TV room. Mom knits and Sophie works on her Legos, and they watch TV. Mom always orders a little take-out supper for Sophie, and she eats it at one of Mom’s little TV tables. “Is it relaxing doing Legos?” I asked Sophie. We admired the police station extensively. “You should blog about me again, Leslie,” Sophie suggested. Jake wanted to have another noodle fight, so he and Sophie and I went outside and ran around in the dark, hitting each other and screaming and hiding from one another in the neighbors’ yards. Of course it was the 10-year-old who was talking sense. Sophie made these wonderfully wacky cupcakes.